Dimensions 7" x 20" x 4"
A great, attractive butterfly house. Perfect for your garden. This butterfly house should be mounted on a pole (not included) in your garden. Back opens to allow placing of tree bark and other butterfly friendly materials. 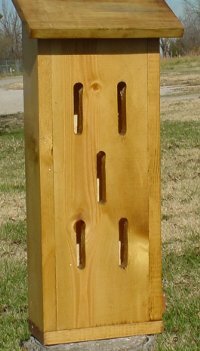 This butterfly house can be ordered with a number of stain options and all are finished with a polyurethane finish. Dimensions: 7" x 20" x 4"